End of Year Exhibition- Foundation at Aberystwyth Arts Centre. Summer 2013. This was my exhibition at the end of my first year on the Foundation in Art and Design course at Coleg Ceredigion in Aberystwyth. I used mixed media to create these paintings. We were given a list of working titles as a brief as part of the exhibition which was entitled "Now and Then". I am astonished by the resilience of wildlife living alongside an ever expanding human population as they battle against persecution and loss of habitat. 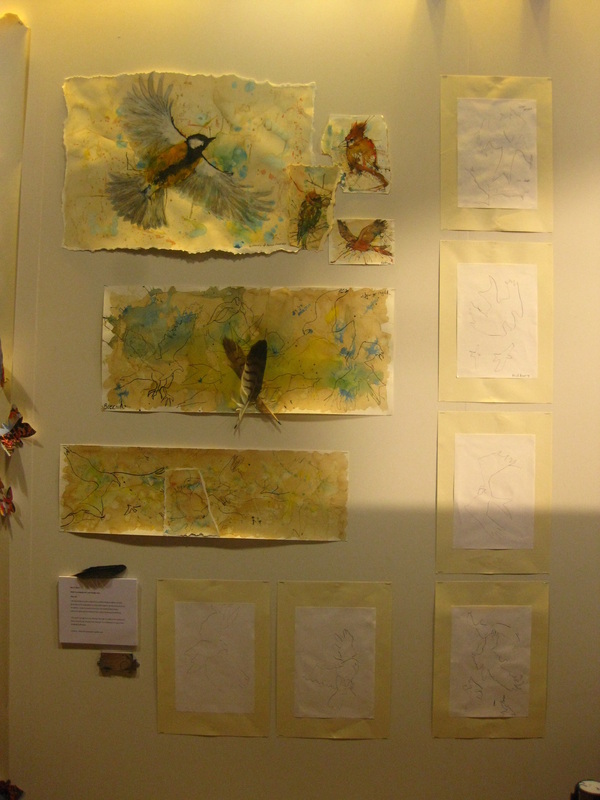 I have focussed on birds for this work as they have a particular grace and movement that I enjoy drawing and painting. This work in progress is my attempt with the use of watercolour, inks and coffee, to capture the essence of birds, in particular the Red Kite 'Barcud', in a mishmash of colour and drawing techniques. "Barcud" End of 1st Year Foundation Art and Design Exhibition work. I will add more detailed images of my exhibition work soon. These will be available as limited edition prints in future should anyone be interested.